Do you have time on your side or is your retirement approaching faster than you thought? Managing your income during retirement is much easier when you have the right strategies in place – and the earlier the better. 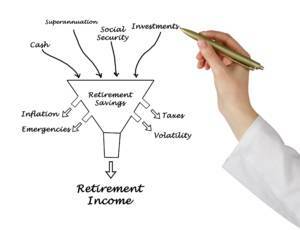 It is important to make sure you have a variety of income sources, in varying quantities and different degree’s of liquidity to feed in the top of your retirement savings funnel. The earlier you put your retirement saving strategies in place the more time you have to let your investments grow. This seems logical but it is vital if you want to maximise your opportunity for growth and accumulation without compromising your comfort level – leaving it to the last minute might require you to take on an increased exposure to risk, like market volatility, to try and reap the higher rewards in a short time-frame. You don’t want the Retirement Income to be only a trickle, leaving you short of cash after all your years of hard work – you want and should be able to enjoy your retirement years. We know that every client is different – their retirement plans, their comfort with risk, their starting point of savings and what they really need to ensure their life is both long and happy. That’s why we offer bespoke financial planning services. No two clients are exactly the same, so of course no two financial plans we be exactly the same either. Talk to us today to find out more about your retirement savings plans and what you need for a happy life – we’ll create specific strategies for your unique situation.